Southend Boys’ and Girls’ Choir perform with Collabro! On Monday 18th March, Southend Boys’ and Girls’ Choir sang onstage alongside Collabro at the Cliffs Pavilion, in Southend. Britain’s Got Talent winners Collabro, have invited youth choirs from across the UK to perform alongside them on their ‘Road to the Royal Albert Hall’ tour this year. Southend Boys’ and Girls’ Choir, who are supported by the Jack Petchey Foundation through their Achievement Award Scheme, secured this incredible opportunity by applying to the group’s nationwide competition. In September, Collabro started their search for the best youth choirs across the country to join them onstage. The Southend choir applied for the opportunity and were selected as the lucky group to join Collabro at their show. The Jack Petchey Foundation works to inspire and motivate young people to reach their full potential through grant-giving schemes in schools and youth clubs across London and Essex. They also fund various programmes to encourage young people to participate in new activities and explore exciting opportunities. Therefore, the Foundation fully supports the group’s initiative to give young people a platform to develop skills and present their talents. This isn’t the first time the musical-theatre group have invited young singers to join them on stage. 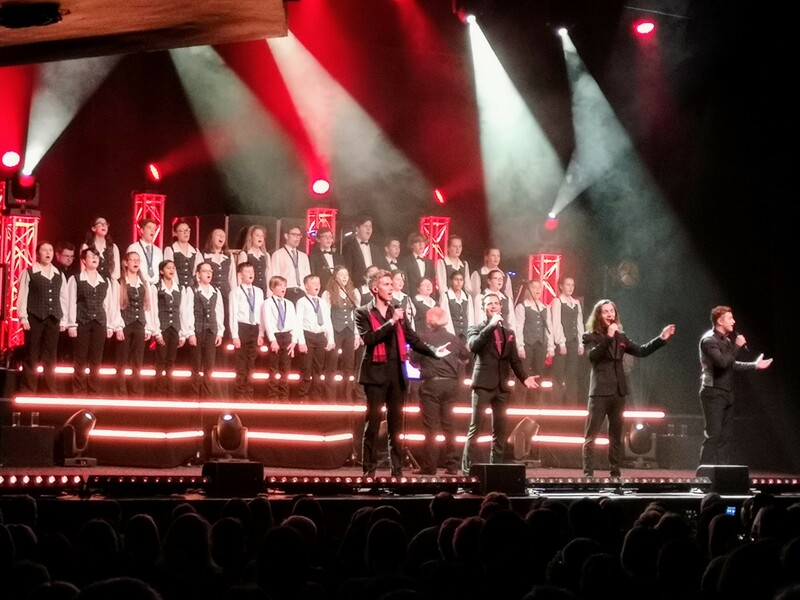 The Southend Boys’ and Girls’ Choir have been lucky enough to perform with the group at their last performance at the Cliffs Pavilion and, after a successful show, they were selected to return for the ‘Road to Royal Albert Hall’ tour. A mixed group of 30 singers from both the Boys’ and Girls’ choirs were selected to perform at the show. They all got the chance to present their talent on stage alongside the group, as well as meet them during rehearsals and backstage. This opportunity will encourage the young performers to develop their performing skills and confidence on stage. The youth choir offers local young people the chance to explore their performing arts skills, develop their confidence and form strong friendships too. They regularly sing at one-off performances, representing Southend by singing at venues from St Martin’s in the Field to the Royal Albert Hall in London to venues in Hong Kong and Australia!